I was walking along the harbour on this cool and grey day. As I started along the boardwalk that juts into the water, I saw an unexpected number of crows hopping on the wooden railing. Crows are not common along the busy part of the port, particularly in this number of about a dozen. Odder still was the fact they kept in the proximity of a short man walking slowly along. The crows kept moving beside the man. They were even jumping over each other, keeping pace. I thought he was some sort of bird whisperer, for they came within a meter of him, showing just the barest caution. I wondered at it. I got close enough to see what the man was doing. He was dropping peanuts along the top of the railing.I was unaware that crow like peanuts. And he was being surreptitious about his actions, either for the benefit of the crows or because he did not want people to see his actions. He dropped peanut after peanut on top of the railing as he kept walking. The crows fluttered and followed, picking a peanut apiece. This kept on for five minutes as the man led the crows along the whole boardwalk. 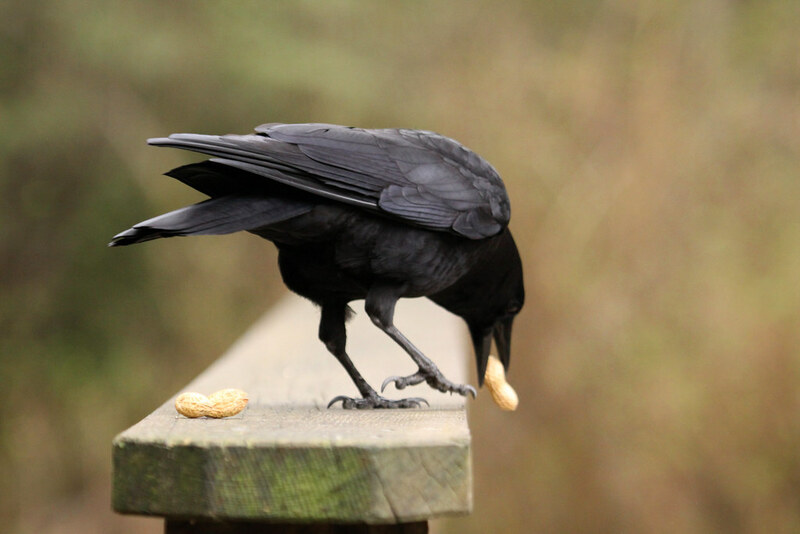 Each crow was meticulous with each peanut, downing it before hopping and fluttering forward. The man came to the end of the railed part of the boardwalk and continued on his way. The crows kept following him, flying to the top of buildings, and even flag poles, as they kept an eye on him until he faded into the distance.